Click through for more photos and instructions. Step 1: Cut out two pieces of crepe paper and a two 12 inch pieces of wire. Step 2: Crumble one of the crepe paper pieces into a ball and cover the piece of the wire so that the ball folds over the wire. Step 3: Fold the other piece of crepe paper over the ball and squeeze around the bottom of the ball. 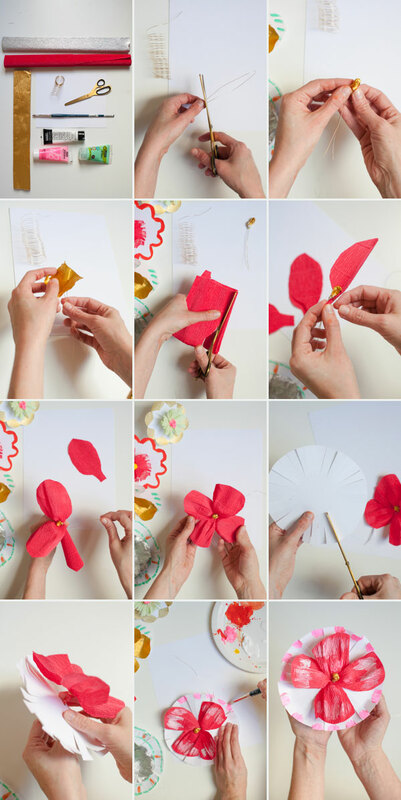 Step 4: Cut petals out of crepe paper. Step 5: Begin placing petals around the ball base of the flower and wrap with the second piece of wire to secure in place. Continue until you are satisfied with the look of the petals and have finished the length of the wire. Step 6: Cut out the shape of your flower base on cardstock. Step 7: Paint if desired. Step 8: Cut a small hole in the center of the flower base and pass the wire though. Step 9: Using the wire, secure the flower to the branches. Wow. This project is so cool. I love the color combination. Lovely! Can you tell me where that desk is from in the second image? So cool! I couldn’t help but notice the clock screensaver in the second image. I’ve been trying to get that exact same one. Can you please share where you got it? Thanks! so good! This would make me smile every time I saw this on my desk. Loving this! So cheerful. Every home should have one! I love these flowers and I love that desk. Great post! so pretty!!! 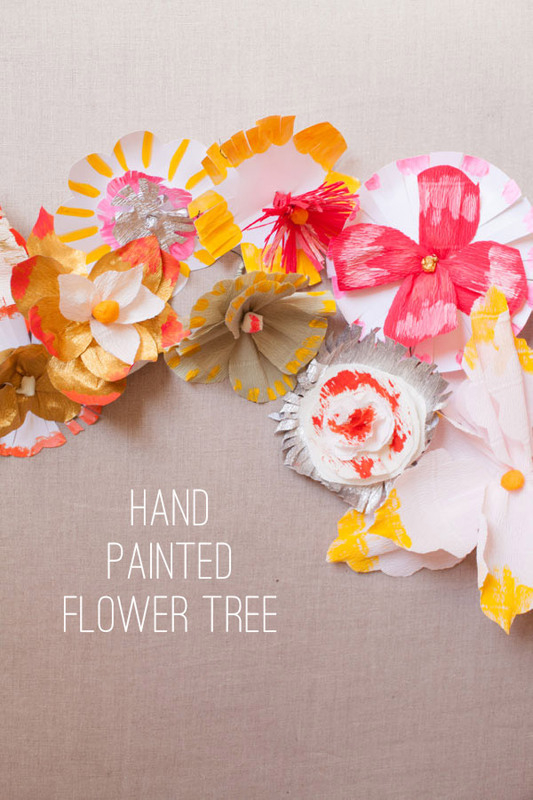 where do you get branches that were used with flowers? love all that you do. so good! and that simple desk is exactly what my studio space needs. jordan ferney crafty genius! Oh my god, I think this is my favorite post you’ve ever done!! So adorable!! OH YES. Yessee yes yes! I make seasonal stick trees with my daughter. And I was stumped what to do for summer. Um, I just found it, IN SPADES! Love this~ so pretty!! Can I ask where you got that thing that’s holding your ribbon and craft supplies? So awesome! 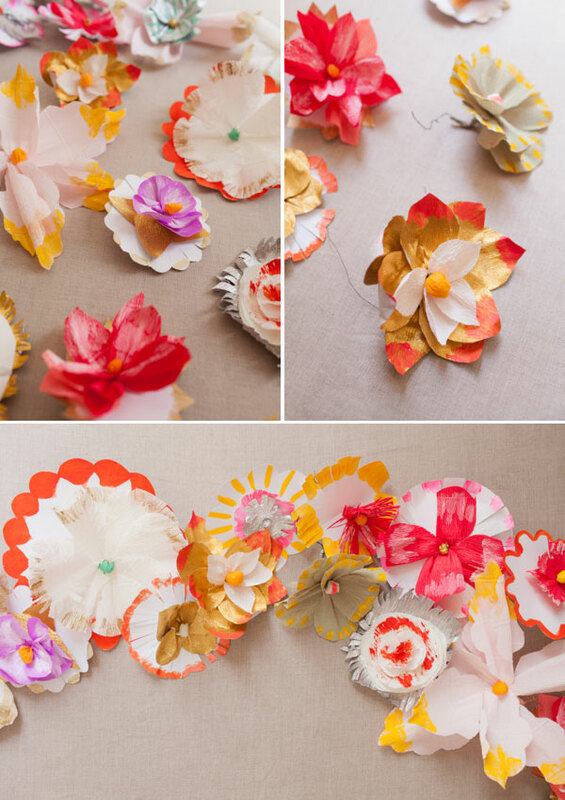 Those paper flowers look fantastic – so colourful!! Whereeeeee did you get that cool wall organiser with all those pretty ribbons on it from??? the perfect weekend craft to do with my daughter…a little gardening outside…a little “gardening” inside! i love the entire set-up. Beautiful! Off topic, but I do have to ask – where is the desk from in the 2nd pic? 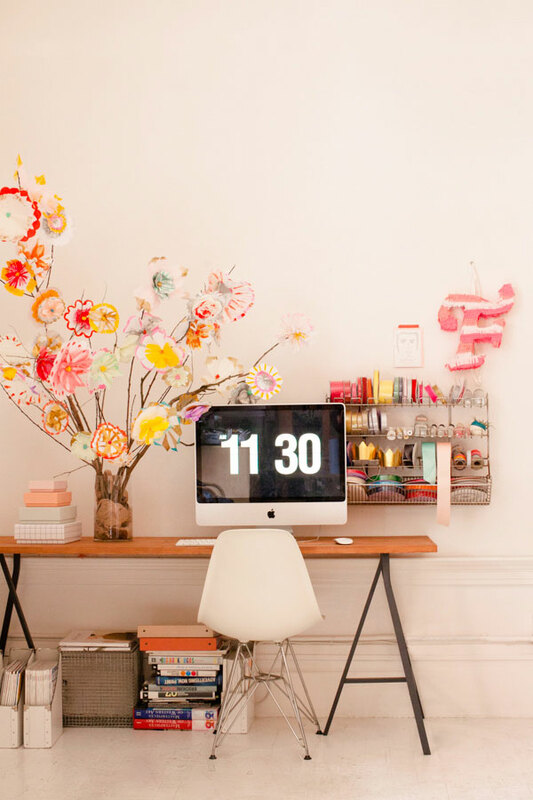 I LOVE the legs – would like to get something like that for my Ikea desktop … can you share the source? Thanks. The legs were from Ikea. Wow! 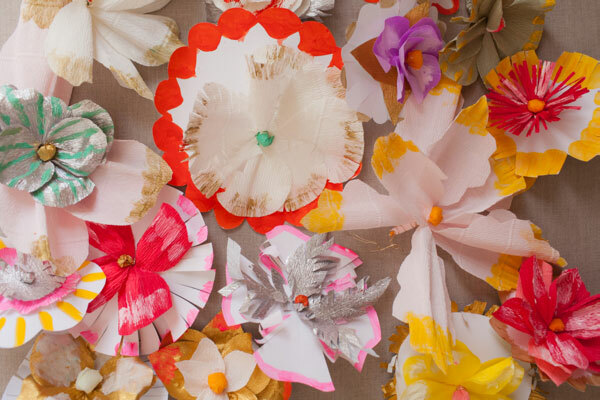 I made some paper flowers for my library’s Day of the Dead display last year (I volunteer there sometimes, it’s lots of fun!) but they didn’t look anywhere near as cool as your flowers! I will have to show this to Laura (the librarian I volunteer under) for next time! I have been trying to find a wall rack for ribbon for.ev.er. Where is yours from? Cute idea! I just started reading your blog and it is brightening my days! Where did you find the ribbon holder that is mountedon the wall? I got it off ebay!